For the month of October, I'll be sharing my frock-friendly outfits each Friday - as part of FrOctober, which I told you all about on Tuesday's post. It's all in aid of a great cause so get your legs out and share your pictures! 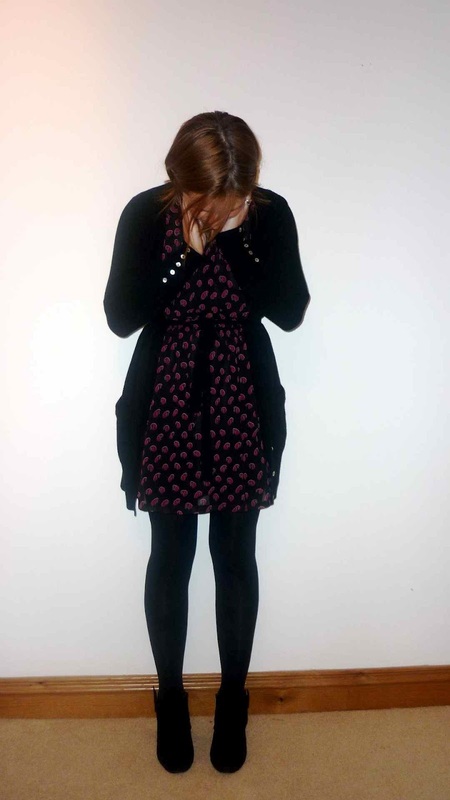 The first dress I wore this week was my Benetton navy wool one - a late sale bargain from March this year. I only wore it once (here), then it went away in the winter storage bag. I got very excited when I took it out at the weekend! Wool mix, sleeveless with a kick pleat to the front and fully lined, when I wear this dress with a long sleeved top underneath it's super cosy. 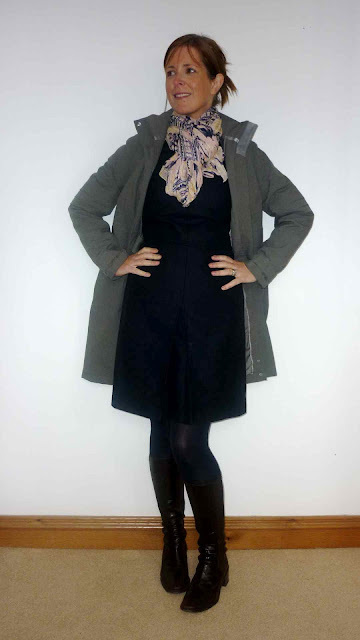 I wore it with my Wallis scarf which picks up both the blush colour in my top and the navy of the dress. Don't forget, my Marks & Spencer competition closes tomorrow night so make sure you've entered before 9pm! Two gorgeous bird-print scarves up for grabs. Click here to enter and I'll announce the winner on Sunday! You look great and there is nothing wrong with your legs! Both lovely dresses. Love the dresses.I am a dress woman myself. I love wearing them but last winter I struggled with the length of dresses. I like them to go to the knee or just above, but for some reason all the cute dress were way shorter. Really like the first dress, without being rude, this is one of the best outfits I've seen you post. Lovely. I have to say I like you cheeky! The DP dress looks AMAZING on you. You look young, flirty and pretty damn good! If I had legs like yours I would get them out more often. You always look great and inspire me, but that outfit looks the best. Avail your legs are fab,keep wearing the little dress. I need a dress like the first one. 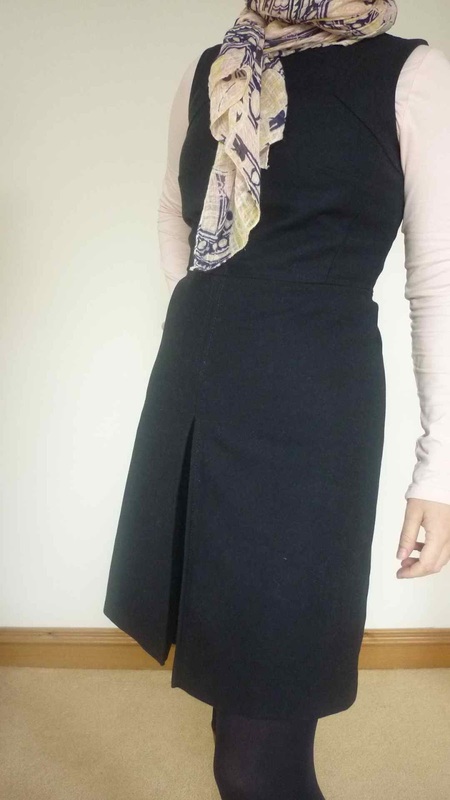 I bought the Lands End tweedy one you featured a few weeks ago and it is the ultimate teachers dress (versatile colour,pockets for pens etc,slight stretch,not too short and versatile as you showed). I'd love another one.....but where? Sorry Avril....I do know how to spell your name honest!!!!! Great dress and love the way you wear the scarf. Love both dresses! The kick pleat one looks really smart and the DP one just right for a more casual look. x PS your legs are great! Laughed out loud at bending from the knees rather than the waist .. instant vision of some Austrian ski instructor following you around shouting 'bend zee knees'. Love the second dress on you, have no idea why you don't appreciate your great legs!